Day two of the Royal International Air Tattoo at RAF Fairford has been cancelled, organisers have said. For the first time in 38 years both days of the event have been called off after heavy rain left the airfield and car parks waterlogged. 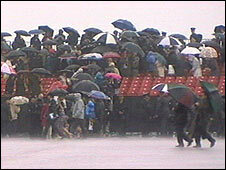 Hundreds of planes and up to 150,000 people were expected to attend the event in Gloucestershire. A statement from the organisers said: "The decision was taken following lengthy discussions between the organisers, police and other safety services. "It was based on concerns for our visitors and the disappointing conclusion was that we could not fully safeguard them." "Having worked towards this air show for the past 12 months, my team at the Royal Air Force Charitable Trust Enterprises and our band of 3,000 enthusiastic and loyal volunteers share the huge sense of frustration." Plane enthusiasts Steve Roden, 52, and his wife Leslie, from Haughley in Suffolk, have been camped at the site since Tuesday. Mr Roden said they heard the announcement over the site radio and from their tent they could see the beer tent where all the heads dropped. "It just brings tears to my eyes," he said. "We just hope we can get onto our stand on Monday to watch them all leave." The weather forecast for Sunday is dry with bright sunny spells, but downpours earlier in the week have left the car park ground with deep ruts of mud. Mr Roden said: "At least we got to see the Raptor fly and that was awesome so I suppose we'll keep smiling and look forward to next year." The senior police commander for the Air Tattoo, Supt Tony Godwin, said: "It is with deep regret that the decision has been made to cancel the Royal International Air Tattoo on both days. "This decision was not made lightly. It was made in the interest of those visiting or working at the event." People have been asked not to travel to RAF Fairford on Sunday. The Air Tattoo has set up a helpline advising customers how to claim ticket refunds as this cannot be done from the base itself. Details of ticket refunds are available from the website or people can call the Air Tattoo Helpline on 01285 713300.